A stylish truck is one thing, but having one that meets all of your needs and provides equal doses of comfort, practicality and reliability is a huge win! That’s exactly where the 2017 Honda Ridgeline lifestyle pick-up truck comes into the picture. And, it’s all new for 2017, bringing in the next generation of styling and frame architecture. The 2017 Honda Ridgeline is a smart looking truck and delivers on the style front just as well as it does on practicality. With a bold new front face, stylish headlamps and a unique design for the LED tail-lamp clusters, it has great road presence and looks very modern. The lines are simple but effective, giving it a no-nonsense stance and a rather beefy appearance. It looks modern and purposeful, with the 18-inch wheels looking right at home under the large and rather pronounced wheel-arches. The long truck bed has a two-way tail-gate and offers a generous payload capacity of 1584 pounds which is on par with it’s competitors. Honda isn’t known to skimp on their interiors and the 2017 Honda Ridgeline is no exception. It offers one of the most well-put-together interiors in the segment and well a lot of space. Adding to the comfort is the tri-zone automatic climate control which also employs an air filtration system and humidity control. The RTS trim-level on the 2017 Ridgeline is a good value. The information console behind the steering wheel is a 4.2-inch color unit. It also offers several convenience features such as power door- and tail-gate locks, and power windows all round with an auto-up and down function for the front side windows. The multi-way adjustable front seats in the new Ridgeline are large and comfortable. The rear seats are 60:40 split and even better accommodating of rear passengers as well as cargo in the under-seat storage area. The 2017 Honda Ridgeline is offered with a 200W, 7-speaker audio system which also includes a subwoofer. A 5-inch color screen and a USB audio interface with an aux-input jack are standard, as is Bluetooth connectivity for hands-free communication and audio streaming. All things considered, it’s a pretty good daily driver. Never known to compromise on safety, Honda offers standard Vehicle Stability Assist and Traction Control. Anti-lock brakes with EBD and Hill-start Assist are standard equipment as well. A multi-angle rear camera is a boon on pick-ups and the Ridgeline packs one with guidelines in the display. Oh, and there’s also a tire pressure monitor, because having the correct pressure in the tires at all times is very important. Honda’s Advanced Compatibility Engineering delivers an ACE yet again with a strong, crash-energy absorbent body structure. Further passive safety features include dual front airbags, side airbags and a side curtain airbags that are equipped with a roll-over sensor. Child safety is also a high priority and the Ridgeline includes child-seat anchors all across the second row. At the heart of the all-new 2017 Honda Ridgeline is a refined 3.5L V6 that brings new fuel-saving technology. It features direct fuel injection, EcoAssist as well as variable cylinder management – where it can shut off cylinders when full power is not needed, for instance, while coasting on the highway. The changes not only make it more efficient, but it also means that it produces a higher peak output of 280 hp @ 6,000 RPM with a credible 262 lb-ft of peak torque available at 4,700 rpm. That means it is the most powerful version of the Ridgeline to go on sale thus far. A 6-speed automatic transmission drives all four wheels. 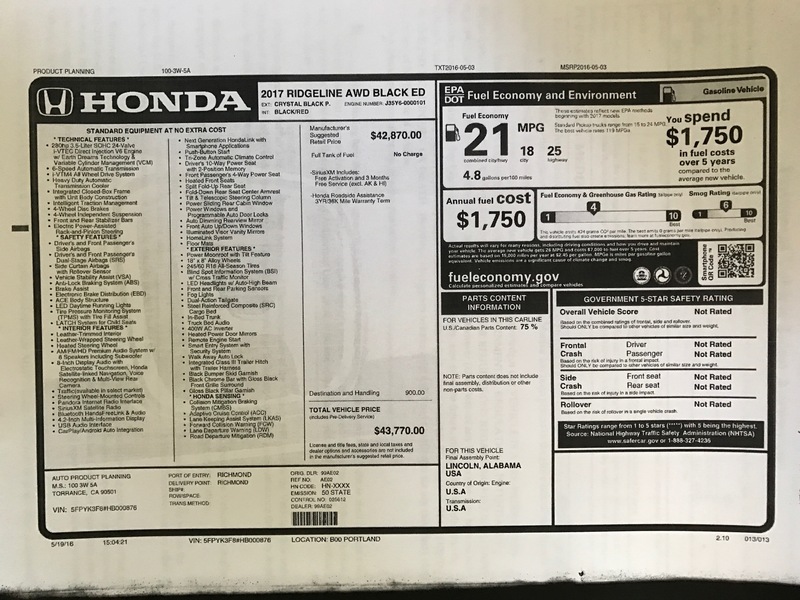 If you’re wondering about the option, yes, Honda does offer a front-wheel-drive version for $1,900 less, which is sufficient, really, for all-road and all-weather purposes. However, if you happen to live where it snows in the winter or frequently encounter rough terrain on your travel, we recommend that you stick with the 4WD version. Its variable torque management program delivers optimal traction in mud, sand and snow. The Ridgeline offers 7.3 inches of ground clearance which is more than adequate if tackling some of the really rough stuff isn’t on your agenda. On the road, however, the 2017 Honda Ridgeline stands out with impeccable ride quality and commendable handling characteristics. It’s easy to drive and gives you the feeling of control. The all-wheel-drive model can tow up to 5,000 lbs, which isn’t as much as some competitors, but, all said and done, when these elements come together, they do make it a seriously capable truck and a comfortable daily-driver. Peace of mind is usually standard on any Honda and the 2017 Honda Ridgeline reinforces that belief with a 3-year/36,000-mile limited basic warranty and warranty on genuine accessories installed at time of purchase. You also get a 5-year/60,000-mile powertrain warranty and 5-year/unlimited-mileage corrosion warranty. Furthermore, you also benefit from a 3-year/36,000-mile 24×7 roadside assistance package on the purchase of any new Honda vehicle. The 2017 Honda Ridgeline makes an interesting addition to the mid-size truck segment. While it does offer a refined ride and handling package, its duty and load capabilities are a bit limited because of its 5,000-lb tow limit, low ride height and limits of articulation on the suspension. However, if general utility, comfort and refinement are a higher priority than tackling unruly terrain and hauling 15,000 pounds then the Ridgeline makes for a world of good. Previous Entry Carjojo is a definite GO! GO!